More than 16,000 participants at Urbana 12 were powerfully challenged with the Great Invitation of God to be actively involved in his work around the world. See the Summary Video of the conference. After a public call to commitment, more than 800 new believers stood with glow lights to demonstrate their new faith in Jesus. A total of 3740 people re-commited their lives to Jesus. One evening, 32,000 Caregiver Kits were assembled to distribute to AIDS Caregivers in three African countries. During the week, numerous innovative social enterprises were launched, and a special offering raised $800,000+ to support specific missions around the world. Conversations overflowed at our NCF booth in the Exhibit Hall. We talked to 35 students who are interested in starting NCF ministry on their campus, and 12 who want to learn more about NCF staff, plus scores of nursing students with serious questions about how to serve the Lord in their nursing careers. 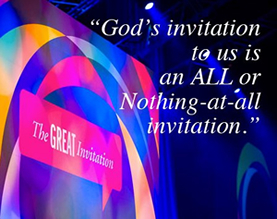 Watch all the Urbana 12 videos of featured speakers, drama, testimonies and join in God’s Great Invitation.